Back to the case. I've read everything about Ronnie's death I could get my hands on, and considering my role as watchdog in the community, I've got sources that would have made Agent Fox Mulder jealous. And every time something new comes to my attention, I call the local police and tell them what I know. It's the job of the police to investigate leads. I can't help it if I turn up more in a day than most people could find in a year. Just because some of my theories sound a little out there doesn't mean they're not true. The only people who are willing to help me are my best friend Jerry and his daughter, Margo. I know Jerry doesn't like it when Margo puts herself in danger, but this time he--well, I can't really tell you what he's doing about it. Let's just say we're working together in ways nobody expects until I can expose the truth. I'm not going to be the object of a conspiracy. No way. If the police aren't willing to dig into the evidence I keep finding for them, then there's only one thing left for me to do: Contact Oliver Stone. He worked wonders with the information I gave him on the JFK assassination. I'm sure he'd be interested in the Domino Conspiracy taking place right here in Proper City. 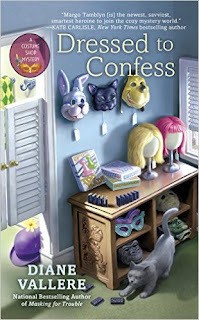 Get Dressed to Confess! Tell Don what conspiracy you think he should investigate next (if this whole murder investigation gets sorted out) and enter to win a copy. US: choice of paperback or ebook (Kindle copy), International: ebook (Kindle) copy. Contest closes Monday at midnight PST. Good Luck! I was in Peru and spoke to a conspiracy theorist. He was quite strange, but did say that unexplained mutilation of animals is due to alien invasions. You should investigate that one. The myth that Elvis is dead. He should investigate whether cats can actually see spirits. paperback. bobwiesmann at gmail dot com. The fake news conspiracy. Is the news we see on TV or read about, really made up? I have some of your ebooks. It's really cheap so I was really excited. Then reading them was t as fun as a real book in your hands. Hi Diane and Don. This book sounds fun and when this case is settled, how how working to finally determine if Russia influenced our last Presidential election? I think Don should investigate why hotdogs come 10 to a pack but buns only 8 to a pack. What are they trying to put over us? I'd like a paperback if I should be lucky enough to win. Congratulations, Sue Leis! You're the winner! I will put Don on that hotdog/ hotdog bun conspiracy right away. Watch your email for an email from me collecting your address for the paperback.